This is the standard installation of Joomla – CMS. We need to download Joomla installation package from the official Joomla website “Joomla.org”. Click the Download Joomla and save it your located directory. Once we have downloaded it, we need zip software to extract files. Second step is to create a database into the web host. We do not need to understand how database works; we are just going to use it by following the simple guide. To create a database, we need to specify a database name, a database user and for the password for the user. Log in to the control panel by using host information. Click the MySQL database wizard in the control panel. 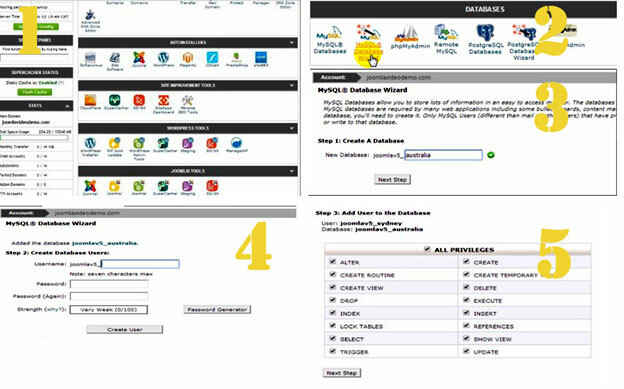 Enter username and password to the database and click create user button. On the next page, leave all the boxes checked and proceed to the next step button. We need to upload the Joomla files to our web server. We will see the actual steps of uploading file, using cPanel. 1. We will log into the control panel and look for file manager in the file section. 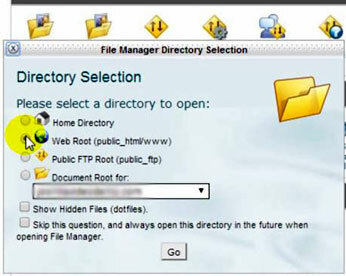 Click the file manager and choose the default option “web root”. 2. We will see our hosting account where website files are stored. In cPanel, there is a folder name public_html. This is where Joomla file will be uploaded. We can create sub folder in that directory as well by just clicking on the new folder at top. Click on the right folder where you want to upload your files. Click the upload button, navigate the downloaded Joomla files, and upload to that directory. 3. When uploading finish, click the backlink. We will see the filename of our Joomla package. Click the filename and extract it using extract button towards the top. This process will take some time. If we have uploader our installation package correctly, we will see the installation page by navigating domain or subdomain address. Enter Site name, Description, Admin email and Admin password to the blanks area appropriately. Once we have filled all the areas, we can click the next button to move on to the database section. In the database section, we will see information boxes like Database type, Database name, Username, Host name and Password. We will leave database type MySQLi and Host name as Localhost, and fill the form appropriately. Click the next button to go to the last page of Joomla installation.